If you’re like most buyers, you may require some kind of financing to buy a West Knoxville home. You may have an idea of what you think you may be able to afford. But, without talking with a loan officer first, you won’t really know how much you can afford. 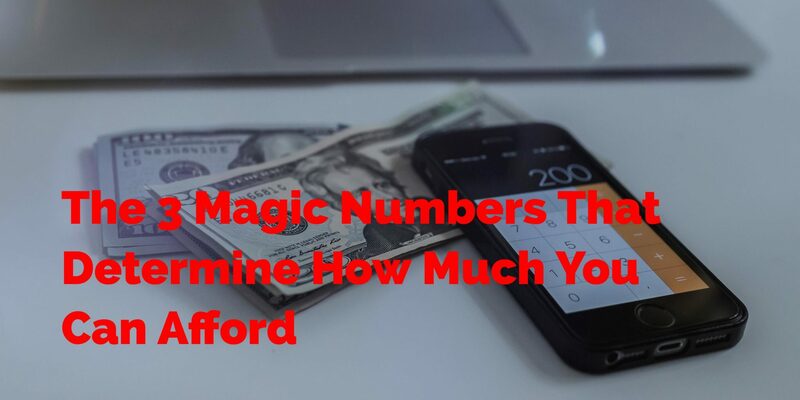 In this post, we’ll cover the 3 magic numbers that determine how much you can afford when you get a West Knoxville mortgage. Your overall financial status will play a large role in determining how much you can afford when you buy a West Knoxville home. This can be broken down into two parts: your income and your assets. Both of these play a large role in determining how much you can afford. First and foremost, you need income. Without income, you won’t be able to show that you can buy a West Knoxville home. A mortgage company will want to see that your income is dependable and regular. If you make bonuses or commission, you’ll probably need to show at least two years worth of income. You’ll want to show that you’ve been employed at the same place for awhile since quitting and changing jobs can raise lots of red flags. Assets play another important role as well. There’s a large difference between having $500 in your checking account and $50,000 in your checking account. While you don’t necessarily need to put a ton of money down on a home, it helps if you have some sort of down payment and can show that you have reserves in case of an emergency. The more money you put down on a home the lower the interest rate you’ll receive. This will allow you to afford more home as well. Another important thing that will determine how much you can afford in a West Knoxville home is your credit score. Your credit score shows how responsible you are with your debt. When your lender is looking at your credit score, they’re looking at the score compiled by the Fair Isaac Credit Corporation (FICO). Your FICO score is computed by looking at your credit from the three major credit monitoring agencies: Equifax, Experian, and Transunion. While these figures are the general guidelines, they aren’t true for all lenders. Some may have tighter guidelines, while others will have looser guidelines. The better the credit score the better rate you’ll get when you apply for a loan. When you get a lower rate, you’ll save yourself more money. The type of rate you’ll get based on your credit will depend on your mortgage company and loan type, so feel free to check around. Finally, your debt will also play an important role in how much you’re able to afford. Debt-to-income ratio is a simple way that lenders measure your ability to make payments. It measures how much debt you have compared to your gross monthly income (i.e. income before taxes). To figure out your DTI, you take all your monthly debt divided by your gross income. For example, if you make $4,000 a month and you have $1,575 in total monthly debt, your DTI is 39%. DTI is a good way to show lenders how much of your current income currently goes towards you monthly debt. Things like student loans, car payments, and credit card debts are all things that can add up quickly. If you’re so overspent on you current monthly debts, your DTI will show that you may not have enough room for a mortgage based on your current debts. Generally speaking, having a DTI of less than 50% is considered good when applying for a mortgage. Anything lower than that is good, too. Anything higher than that could make it hard for you to get approved for a loan. Keep in mind though, the specific numbers of what is allowed for DTI varies on the type of loan, some are a little stricter and some are a little more generous. Be sure to talk with a loan officer to see where your numbers specifically need to fall to get approved for a mortgage.